Winix - WAC5500 : Air Purifier Review • The Air Geeks, reviews of air conditioners, dehumidifiers and air purifiers. Have you been struggling to clean the air in your room? The WAC5500 is a strong air cleaner that is based on some of the best air purification mechanisms. This air purifier blends different air purification technologies to ensure that your room is clean and free from airborne particles, allergens, irritants, and bad smell. In addition, the WAC5500 is capable of removing even the smallest of known airborne particles. If you are looking for a good air purifier for your room, then you are in the right place. Considering that you might have already identified the WAC5500 and you want to know more about it, we have compiled all the information that you need about it. Not only have we covered its features and performance, but we have also researched well to provide you with its merits and demerits. By the time you are through, we hope you will be able to make a well informed decision on whether this is the right air purifier for your needs or not. Ready? Set, go! 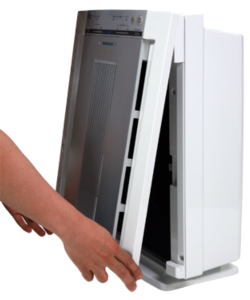 The WAC5500 is a strong air purifier that is based on the True HEPA technology and Plasmawave technology. Its employs a three-stage air cleaning process to ensure that your room gets clean and fresh air. What is the size of your room? 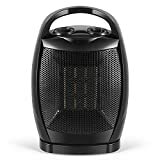 According to Winix, this air purifier is suitable for a 350 square feet space. However, we observed that better results are achieved when the unit is used in a slightly smaller room. If you have been having a problem while controlling airborne pollutants, allergens, and household odors, the WAC5500 delivers a high efficiency to ensure that your room is dominated by clean and fresh air. This air cleaner is capable of capturing up to 99.97% of airborne pollutants. Its features the True HEPA filtration technology, Plasmawave technology, and a carbon pre-filter for eliminating bad smell. To start with, the carbon pre-filter reduces household odors from pets, cooking, and smoke to mention a few. The True HEPA filter captures a wide variety of airborne particles including mold spores, pollen, dust, microbes, smoke, pet dander, et cetera. This filtration mechanism is capable of capturing airborne contaminants that are small as 0.3 microns. The Plasmawave technology works by neutralizing various allergens and irritants including odors, chemical vapors, allergens, et cetera. This technology breaks down these pollutants at molecular level to create harmless byproducts. According to Winix, the CADR values of this AHAM certified unit are: 251 for pollen, 216 for dust, and 235 for tobacco smoke. Does the unit allow a user to monitor the quality of the air in a room? Yes, the WAC5500 has smart sensors that help you to monitor the air around you. In auto mode, the unit checks the air quality condition on a scale of 1-5 and changes the setting of the fan to a suitable speed. In case you want to adjust the speed of your air purifier manually, the unit allows you to set it to Low, Medium, High, or Turbo. Furthermore, the WAC5500 has an alert system that notifies the user to replace a worn out filter. Like most air purifiers, this unit produces a loud sound. The loudness depends on your settings and the sound is loudest when the unit is in the Turbo mode. When the unit is running on the lowest speed, you can hardly notice the sound. This unit is quieter than most air purifiers of same or lower capacity. For instance, we compared it with the WAC5300 and noted that there is a significant difference in the amount of noises that the two produce. Features a remote. This unit comes with a remote control that allows users to adjust the settings without walking to where the unit is positioned. Fairly quiet. Compared to most air purifiers of same or lower capacity, this unit is quieter. Washable filter and a filter change alert system. You can clean the filters by vacuuming them. The alert system notifies the user to replace a worn out filter. Plasmawave technology can interfere with wireless networks. We observed that the Plasmawave technology may interfere with some electronic devices. You should select a suitable position for this unit to ensure that it does not interfere with your TV or network devices. Chemical smell. We have noted that this air purifier produces a chemical smell. However, this smell reduces and becomes virtually unnoticeable with time. A little noisy but the air quality sensor works well. Farting across the room sets it into turbo mode within 15 seconds and it clears the fumes quickly and efficiently. I purchased four units for the entire house and air quality is noticeably better. I no longer wake up with my nose stuffy and it has helped my postnasal drip during allergy season. I installed a pre-filter and it has extended the life of the filters...will need to be vacuumed every 3 months or so. I'm very happy with my purchase overall." Great product! We did a lot of research and comparing products. Absolutely pleased!" In case you want to improve the environment of your room, the WAC5500 offers different filtration mechanisms to ensure that your room is free from various airborne particles, allergens, and irritants. This unit purifies air quickly and effectively. Despite the good performance of this unit, we noted that it can interfere with network devices if it is positioned close to them. We also observed that it produces an unpleasant chemical smell especially when it is new. If these drawbacks are not a big problem to you, then the WAC5500 can be a suitable solution for your air purification needs.